(pictures 4 and 5 demonstrate this.). Genuine Tupperware jug with original cream colour lid. Tupperware seal for both lid and pourer so hardly any risk of leaks or spills. Slimline shape to fit in the fridge door - perfect for saving space if camping. 3 Vintage Retro Tupperware Cream Beige Lidded Jugs/ Pitcher Sm, Med, Lg Great looking pieces that would look v cool in a retro kitchen or Camper van. All with vacuum lids. There is some age related wear on all of them but nothing to detract from their look. The measurements are as follows: LG 20cm height x 12cm width at top. Med 13.5cm height x 9cm width at top Sm 9cm height x 10cm width at top. Please have a good look at the photo's before bidding. Thank you for looking. Fits in fridge door. Has reversible lid so you can pour from it and then turn it around to keep it airtight. In very good used condition. Very sought after piece of Tupperware,hard to find. Lovely Tupperware jug - great used condition. Harvester Fan Lip Push Button. Beige & Cream. Condition is Used. Vintage Tupperware Jug. Harvester Fan Lip Push Button. Lemon ? & Cream. Condition is Used. Dispatched with Royal Mail 2nd Class. Tight fitting lid. We will point out any defects as we see them. Ovoid shape with side contours for easier grip. Good used condition. I ALWAYS TRY TO DESCRIBE THEM TO THE BEST OF MY ABILITY. CONSISTENT WITH AGE AND USE. WITH GENERAL SIGNS OF NORMAL WEAR. TO UTILISE EITHER SERVICE. Storage Containers Bread Butter Jug Cream Green. • Jug - Cream, Lid fits well. • Storage Containers for Bread Vegetable Fruits. • Rice / vegetable steam or storage container. Lid covers over container however it is a loose fit ( Unsure if this is how it should be). PUSH BUTTON TO RELEASE AIRTIGHT SEAL. Vintage Tupperware Vacuum Lid Jug. Vintage Tupperware Vacuum Lid Jug. In good used clean condition with very slight wear indicative of age and use. From a smoke and pet free home. 70s 80s vintage retro Tupperware beige jug pitcher kitchenalia vacuum seal. 20 cms at its tallest. In good condition. There may be some marks though normal use to the outside. Please see photos which form part of this description. Camping/Camper-Van Retro. Made in Greece by Tupperware. VINTAGE TUPPERWARE JUG WITH PUSH DOWN LID IN VGC. JUICE PITCHER/JUG. WITH PUSH BUTTON LID. In White with Blue lid. Used, in good clean condition. 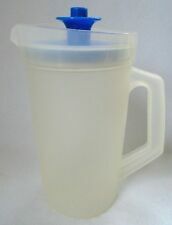 Lovely Tupperware jug which holds 4 pints - great used condition. This is for a Tupperware rice cooker which is in excellent used condition been in the cupboard at my Mums. Included a cream 1 litre fridge jug. Ideal for caravan and camping. Cream base with mustard airtight lid. This jug has a handle near the top. This jug has no handle. Black Lids. Lids can be used to pour or seal. Handy for camping, caravanning, VW camper, picnics. Solid moulded piece with spout opening which closes with a satisfying 'snap'. The base is marked MADE IN GREAT BRITAIN and the lid MADE IN AUSTRALIA. A lovely water , juice or milk jug. Excellent condition. Very clean. The lid has good tight fit. Barely used. Great retro piece and very functional. Tupperware was made to last! Made by Tupperware. A plastic jug. Vintage Orange Cream Tupperware Jug Pourer With Push Button Sealed Lid. Great for picnics, parties, camping, summer days... Please see my other Handpicked retro items :) Feel free to ask questions as photos form part of the description. International Bidders please ask for postage quote beforehand Payment to be made via Paypal within 48hrs otherwise item will be relisted. Happy Bidding!